In management we have invented Newspeak. Original, Newspeak is a fictional language in the novel Nineteen Eighty-Four by George Orwell. The basic idea behind Newspeak is to remove all shades of meaning from language. While in Orwell’s novel the government tries to introduce Newspeak to the people in order to make the people more compliant to its will, in the case of management it is our own fault. We managers use our own Newspeak and we have taken all meaning out of it. Newspeak is all about saying almost nothing with great sounding words. Every bank had its risk management system in place, used sophisticated mathematical simulations, had dozens of compliance officers, trusted well-paid analyst in their triple A ratings. And what was the result? They did not see that a mortgage given to somebody with inadequate income will always be a bad loan regardless how often you mix it with other subprime loans and regardless how much financial modeling you apply. And I will hear now all my friends from investment banking that you can decrease the risk by pooling loans. Well, this pooling works well with uncorrelated loans but if they are all bad loans in the same market, well, then bad stays and bad regardless of how much you diversify. For a great overview of financial Newspeak, click here for a pdf file. It is “The [now defunct] Lehman Brothers Guide to Exotic Credit Derivatives”. You will learn everything about Credit Default Swaps (CDS), Collateralized Debt Obligation (CDO) and their modeling. The basic ideas were great at the beginning but when the bankers believed that they could escape the laws of gravity the products turned into bombs to the world economy. And this is typical for Newspeak, at the beginning the words had a meaning but when they became popular, the meaning was diluted and lost. Please be politically incorrect in your firm! 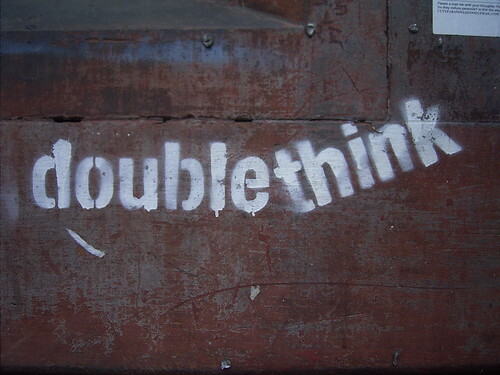 In Nineteen Eighty-Four the government calls a thought that is against the common way of thinking a thoughtcrime. Thoughtcrimes are thoughts that are unorthodox and outside the dominant logic. I want you to commit these thoughtcrimes in your firms. I want you to dig deeper when people use Newspeak. I want you to fight conventional wisdom. Conventional wisdom might be shared by the masses but is not necessarily true. Use your own sense and reason. So if somebody uses the term core competencies ask him what competence he really means, ask him what consumer benefits the competence provides, ask him why competitors cannot easily imitate the competency and ask him if the competency can be leveraged widely across many products and markets. If he can answer all these questions clearly, well than the competency is really a core competence that is valuable and that should be nurtured and protected. Our world of business model innovation is also full of words that many of us use meaninglessly. Business model in itself is such a word. We argue in strategies that we offer a great value proposition to our customers. And, of course, we are so unique. But is that the reality? Are the customers well acquainted with our unique business model or is it a great strategy plan we want to execute or is it just fiction with no support from reality? Be cruel to yourself, the market is much harder! Get real! Do not mix marketing talk with strategy! What job do you solve for your customers? What value or benefit do you offer to your customers? What excites your customers? How do you create the benefit/ value/ excitement for your customers? And how do you earn money with your business? So the first question is about the value proposition (great example here), the second is the value architecture and the third is the revenue model. Simple! So simple is the definition of a business model. And below you find the business model canvas to describe your own business. If you want to print the canvas, you find the pdf of the Business Model Canvas here. And if you answer e.g. that your value proposition is to offer the best service in the industry, you have to be honest about your core competencies. Do they really support the best service? And don’t forget the culture. Do you have the right values and corporate culture to support the value proposition? And please, do not claim that you are the lowest cost-provider with the best service. I won’t believe you unless you have a great value architecture to support that claim, but even then I would be skeptical because that would be a real disruptive business model innovation and they happen to happen rather seldom. And please remember a great strategy is not something what looks great on a piece of paper. A great strategy what works in reality! I do agree with you that a lot of the language which is used in managerial context just serves the cause of being interesting and so much of an expert. Peter Guber wrote an interesting article concerning the honesty-topic in HBR (Dec. 2007) with the title ‘The Four Truths of the Storyteller’. Thanks for mentioning the article by Peter Guber. You raised an interesting question about truth and honesty in management. I think there are different layers of communication and of what you tell. For yourself, you should be honest to yourself and accept the the unvarnished truth about your business. That does not mean that you become a worrywart or pessimist. You just have to be frank. In the business plan you hand over to an investor you should show a realistic, but optimistic view of your venture and the risk included. The investor will “grill” you and your business plan sufficiently so that it is good that you prepared yourself with the first layer. The third layer is the communication with your customers. You focus on the value proposition, on the utility you provide. Here, you do not communicate what you cannot do or where your disadvantages are. You communicate the positive aspects. Previous Previous post: Does a customer care about your corporate strategy?